At Legal Expert we work with a panel of specialist legal solicitors across the country who have helped people with personal injury claims to get the compensation they deserve. If you have had a broken little toe or other injury whilst on holiday, talk to our personal injury specialists. In this case study, we we look at a situation where a claimant suffered a broken little toe whilst on holiday. The claimant in this case, a man who was on holiday, was injured when a wardrobe door fell on his foot. When the door was opened it feel off its railing, falling onto the claimants foot and causing a fracture as a result of a crush injury. The injuries caused the claimant pain and suffering for a year and a half as well as some post traumatic stress for 24 months after the injury. As a result, solicitors acting on behalf of of the claimant recovered £4,500 in damages for the claimant. Accidents and injuries on holiday are more common that many people think. According to figures from the Foreign & Commonwealth Office for 2014/ 2015 Brits made 60 million foreign visits in the year. Of this, 3,250 people had to be hospitalised for a variety of reasons. This was a small increase in the number of accidents, though the number of deaths on holiday did fall. Most people who are injured on holiday do so through risky behaviour or activities which they may not normally participate in at home in the UK. However, as in this case study, even everyday activities which you would do at home can cause an injury when on holiday, just as they would at home. Travel providers and the government recommend that holidaymakers and those travelling abroad for business or personal reasons should ensure that they have adequate health insurance. Within the EU this can be partially covered through an EHIC or European Health Insurance Card. The claimant was on holiday at the time of the accident. The claimants hotel room had a wardrobe with a sliding door. When the claimant used this, the door came off its rail and fell onto the toes of the claimants foot. The door of the wardrobe was quite heavy and large and when it fell, the claimants toe was wedged underneath it. The claimant did manage to remove the door from his foot, however, it was bruised due to the impact and throbbed with pain. A medical assistant at the hotel provided some initial medical treatment using their (limited) equipment. They applied ice to reduce the swelling as well as iodine. After the accident, the claimant had a foot injury and found it difficult to walk over any surface. When the claimant returned to the UK, they visited a doctor and their injury was diagnosed as a crush injury to the toes, causing a broken little toe. The claimant needed to take a week off work to recover from the injury. Following the accident and their return to the UK (at the end of their holiday), the claimant was unable to either bend down or kneel easily. Their injuries also suffered some pain and discomfort for a year and a half after the accident and the broken little toe. The claimant also suffered a degree of post traumatic stress for two years after their injury. The claimant was not able to enjoy the rest of his holiday and he was not able to work for one week after this. In this case study, solicitors acting on behalf of the claimant alleged that the hotel and staff were negligent in providing a guest (the claimant) a room with a faulty wardrobe door, as well as not providing reasonable medical attention and care to the claimant after the accident. Solicitors held that the hotel had not carried out sufficient maintenance and safety checks of facilities, and that this lack of maintenance caused the broken little toe injury. The settlement was for a total of £4,500 and included damages for the loss of one weeks work. In this case, the hotel did not admit liability and initially the defendant did offer to make a settlement without admitting liability. Ultimately, compensation was offered and accepted via an out of court settlement. The broken little toe injury compensation claim totalled £4,500. The broken toe settlement included £3,750 in general damages for pain and suffering as well as the claimants loss of amenity. The claimant was awarded an additional £750 for the loss of time on their holiday, as well as sundry expenses incurred. Legal Expert work with claimants across the country, connecting them with our panel of no win no fee specialists who can help them to make a personal injury claim. If you have been the victim of a personal injury, or injured in an accident which was not your fault on holiday, we can help you. Working with the specialist no win no fee legal solicitors at Legal Expert, claimants can rest assured that they won’t have to face additional financial hardships. Instead we help people to rest and recover, whilst solicitors recover the damages they are owed. Legal Expert and the solicitors we work with do as much as the legal work as possible, this will leave you to concentrate on recovering from your injuries. 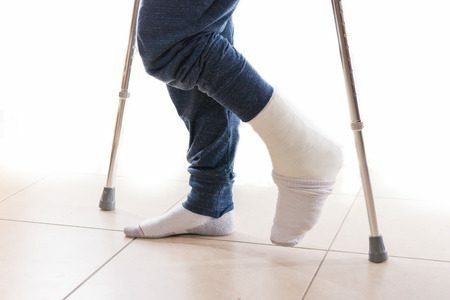 The no win no fee solicitors we work with can help with foot injury compensation claims, this means that no matter your financial circumstances, we can help you recover damages you are owed. No win no fee services mean that if you make a successful claim your legal fees will be paid as part of this, typically 25% or less. If unsuccessful, claimants won’t have to pay any costs, fees or charges, reducing any financial risks. Talk to the specialist no win no fee specialist legal solicitors at Legal Expert today. You can email the initial details of your claim to info@legalexpert.co.uk. Claimants can also talk to our experts by calling us on 0800 073 8804 Alternatively, please use the online contact form on this page and reach out to us today. NHS information on broken toe injuries. Find out more about making a foot injury compensation claim and broken bone compensation claims with our guide.